[Crowd in Town Park at Telluride Blues & Brews Festival. 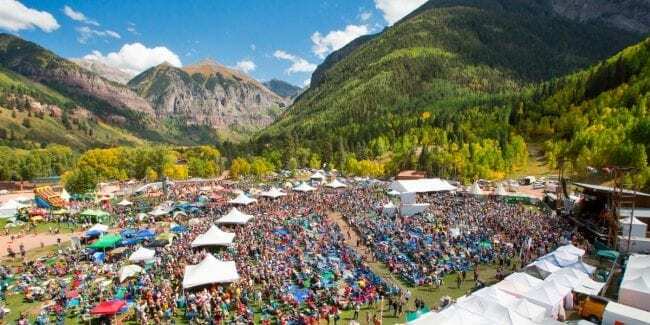 Photo: tellurideblues.com] The festival capital of Colorado hosts another fantastic musical weekend in mid September. The 26th Telluride Blues & Brews Festival brings the best mix of blues, rock, gospel, indie, funk and soul music to the infamous box canyon mountain town. This year’s music fest occurs from Friday to Sunday, September 13th to 15th, 2019 at Telluride Town Park. Head to San Miguel County for 3 full days of world class scenery and blues festivities. In addition to the groovy tunes, the event provides a slew of other activities. The kids can play on the bungee trampolines, a climbing wall, bounce houses and witness fun parades. Adults can partake in the after hours club shows, craft vendors, a 5K race for charity and complimentary yoga classes each morning, not to mention all the craft beer. More than 50 craft breweries will be present showcasing over 150 styles of beer and cider. And there will be plenty of mouth-watering fare to soak up all the booze. What better way to see Telluride than in the colorful autumn for a world class blues festival? There are so many outdoor activities to enjoy, from hiking and biking, to sightseeing via a free gondola ride between downtown and Mountain Village. The event started as as the Telluride Brewer’s Festival in 1994, which invited a prominent selection of the country’s top microbreweries. It then grew into today’s Telluride Blues & Brews Festival. Each member of this year’s elite group of 56 craft breweries is special, offering different styles and flavors of beer. It’s as unique as the top notch musicians performing on stage. On Saturday, the Grand Tasting kicks off the day from noon to 3pm. Some consider the top craft beer event in the Southwest. Everyone gets a souvenir tasting glass to sample the wide variety of brew, from day lagers to heavy IPAs, sours and everything in between. Cheers!